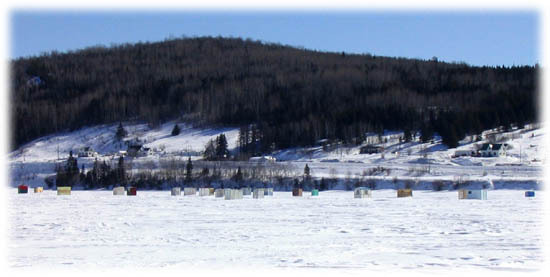 Well, with the arrival of winter and the freezing of the Bay of Gaspé it is once again time for the ice fishing to begin. Every year at this time the Bay turns into a small fishing village as residents of Gaspé brave the cold temperatures and embark on their yearly ritual. And trust me... in the cold temperatures sitting in a small fishing shack, keeping warm usually involves some good cheer.. if you know what I'm saying. I am working on including links to the Sport Salmon fishing that has made the Gaspé area so famous. If you witness an act of poaching, do not ignore it. Call the number above. Poaching should not be tolerated by anyone. To help keep the great fishing alive, report any suspicious activity. It is your fishing in the future that will be hurt.